The soldiers at the cross – who shared their sour wine with Jesus and who did not break his legs to hasten his cruel death, because he was dead already. Annas, the father-in-law of Caiaphas – who questioned Jesus, who had his police strike him for blasphemy, who had him bound as though he were dangerous. Kings and priests, priests and kings …. upholding the law, administering the law, enforcing the rule of law, executing the sentences of the law. Kings and priests …. and friends. But Jesus went on to say more, after he had shared a meal with us, after he had washed our feet as an example, and after his betrayer had gone out from among us. “I do not call you servants any longer, for servants do not know what the master is doing; but I have called you friends” (John 15:15). We are invited to take our stand at the foot of the Cross, joining the small company of Jesus’ friends who are already gathered there. We stand there together, under a dark and threatening sky, to witness the suffering of our Savior, to be with him in his hour of immense pain and desperate need. Peter – whose early-morning bluster and swordplay in the garden earned him a silent rebuke from Jesus, who was undone by a servant girl’s questions, who denied his friend before the sun even came up, but whose confession would become the rock on which Christ would build his Church. Mary – who with her sister and two other Marys stood at the foot of the cross, all of them pierced through the heart for the son and master they had loved, but whose faithfulness meant they would be first witnesses to his resurrection. The disciple Jesus loved – who could not only bear witness, but who could bear up his friend’s mother in her grief, laying her head on his breast just as he laid his head on Jesus’ breast at the table last night. Joseph of Arimathea and Nicodemus – who had much to fear from the chief priests and the council, but who stayed firm in their resolve to do their part. “Kings shall shut their mouths at him,” for his gentle power undoes their shows of force, and “priests by their sacrifices can never take away sins,” for their law of might betrays their true allegiance. But let us – the small company of Jesus’ friends, the Master’s friends – “hold fast to the confession of our hope without wavering, for he who has promised is faithful” (Hebrews 10:23). This entry was posted in Ministry, Sermons and tagged Beloved Disciple, Empire, Good Friday, Hebrews, Isaiah, John, Nicodemus, Peter, Pilate, Suffering Servant, Temple on April 3, 2015 by Rodger Patience. “Good Friday, and all Fridays of the year, in commemoration of the Lord’s crucifixion, except for Fridays in the Christmas and Easter seasons …” are days of special devotion for Christians, according to the Book of Common Prayer (BCP 17). For generations of Roman Catholics this has meant not eating meat on Fridays, for example. Here in Wisconsin, we all enjoy “Fish Fry Fridays” because so many of our neighbors do not eat meat when they go out for dinner. Fridays for Christians are about doing without, sacrificing even a little something in imitation of our Lord, who sacrificed everything for our sake. Today’s reading from the Gospel of Luke recounts Jesus’ triumphal entry into Jerusalem as he heads toward his final confrontation with the religious authorities. Throughout the rest of Holy Week the tension mounts as Jesus says farewell to his disciples, prays that he be spared from the trial, determines to do God’s will, and faces arrest, beatings, and denunciations from soldiers and from the crowd that was with him just days before. “My kingdom is not from this world,” he replies in response to Pilate’s questioning. The Roman governor can do nothing but send him off to be crucified. The prayers in the Daily Office remind us that every Friday is for us a commemoration of that “Good” Friday, just as every Saturday we rest and remember God’s goodness in creation, and every Sunday we rejoice in the power of the resurrection. Though that Friday was a dark and terrible day, we call it “Good” because in it we see the first act in a three-day drama of salvation. 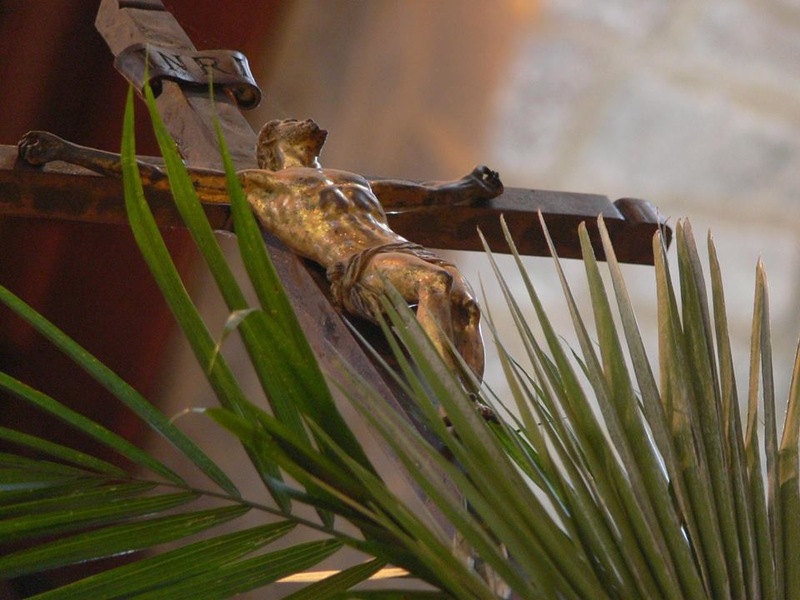 Every Friday — this Friday after Thanksgiving Day just like all the rest — the Church invites us to live a cross-shaped life, imitating our Lord, “who stretched out [his] arms of love on the hard wood of the cross that the whole world might come within the reach of [his] saving embrace” (BCP 101). This entry was posted in Daily Office and tagged Black Friday, Collect for Fridays, days of special devotion, discipline, Good Friday, Holy Week, Luke 19, Palm Sunday, Prayer for Mission, Psalm 140, self-denial on November 28, 2014 by Rodger Patience. Why do we call this Friday “Good”? Just as every Sunday is for Christians a reminder of Easter and the resurrection, every Friday is a reminder of Good Friday and the crucifixion. Just as we live in the light of the Resurrection, we walk in the way of the cross. I believe that the Mystery of the Cross is saying that the pattern of transformation unto God, the pattern that connects, the life that God offers us is always death transformed. The only pattern is the pattern of death and resurrection. We submit to it with trust because Jesus did. On the other side of that dying, whether it is physical illness and death, or the “daily dying to self” of the prayer book, or admitting our powerlessness over our sin, on the other side of that dying we find the truth. The Maker of all things loves and wants me. The Maker of all things loves and wants me — loves and wants every single one of us, loves and wants all of us so much that God was willing not only to endure the limitations of becoming human, but also to endure the suffering and death that is our lot in life. Because he died and rose again, we too can experience “transformative dying,” can claim our small part of the one big pattern. This entry was posted in Daily Office, Lent and tagged Collect for Fridays, Good Friday, Morning Prayer, One Big Pattern, Richard Rohr, transformative dying, way of the cross on April 18, 2014 by Rodger Patience. I’ll admit I had never heard of that being done before, as William said he had experienced at an Episcopal church in New York City. His thoughtful post got me thinking, and I enjoyed figuring out why I disagree with him. I think playing the part of the crowd in the Passion is entirely appropriate as a way of realizing that “while we were still sinners, Christ died for us” (Rom. 4:8). It also helps us accomplish the movement Paul describes to the Colossians: “You have stripped off the old self with its practices and have clothed yourselves with the new self, which is being renewed in knowledge according to the image of its creator” (Col. 3:9b-10). Our creator, “being found in human form … humbled himself and became obedient to the point of death — even death on a cross” (Phil. 2:8). In our old self, I think we are the crowd, preferring spectacle, resistant to change, and easily led. By the grace of God and through the self-offering of Jesus, we are given a new way. Being the Body of Christ means stripping off the old self and following the way of the cross instead of following the crowd. While I completely agree with the ancient homily for Holy Saturday that William shared — “together [with Christ] we are now one undivided person” — I’m also conscious at this time in my life that I am not always the “one person” I want to be. Like Paul, I “find it to be a law that when I want to do what is good, evil lies close at hand” (Romans 7:21). The collect for today, Monday in Holy Week, is very familiar to us as the Collect for Fridays at Morning Prayer. I hope it will remind you as you journey with Jesus during this Holy Week what you used to be like, what happened as a result of his obedience and death, and what you are like now. May this Holy Week open the way to life and peace for you. Almighty God, whose most dear Son went not up to joy but first he suffered pain, and entered not into glory before he was crucified: Mercifully grant that we, walking in the way of the cross, may find it none other than the way of life and peace; through Jesus Christ our Lord. Amen. (BCP 99). This entry was posted in Daily Office, Lent and tagged AA, Barabbas, Body of Christ, Colossians, crowd, Good Friday, Holy Week, Jesus, Palm Sunday, Passion Gospel, Philippians, Romans on April 13, 2014 by Rodger Patience.